Alien loves rings, and has quiet the funky collection (from apple rings, to snakes, to the small to the large, vintage, new, plastic, gold, silver, wood. we've got it all). So one of our favorite hobbies is to look around for cute rings. 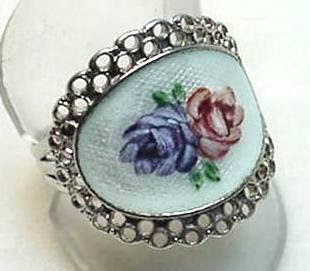 This one is vintage and has roses on it, and I love it ! the price is ehh ish 75 $.